A fully biodegradable Bios urn, made from coconut shell, waiting the ashes of your loved one to be put into the soil. It will be delivered with a pine tree seed (Pinus Halepensis) and everything you need to promote the proper growth of your tree. What type of seeds can I use with Bios Urn? The process for planting is easy. After selecting a proper location, you will dig a hole deep enough to put the entire urn about 5 cm lower than soil level. You put the ashes in the lower part and top it with the upper capsule with soil and pine tree seed. Will my tree need special care? 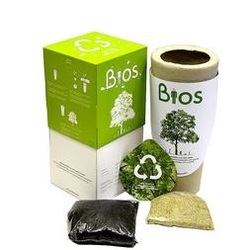 ﻿Your Bios urn tree will need the same attention as any other tree. Be sure to choose a location with enough sunlight and ensure proper humidity by watering your tree when needed. ﻿Whats the difference between the human and pet Bios urn ? The two products are exactly the same except for the graphics on the packaging. They will both insure a legacy by growing a tree thru the ashes of your loved one. Does the Bios Urn have an Expiration Date? There is no expiration date on a Bios urn. If left in it's original package, the Bios urn will stay fully usable & will last 25 plus years in proper storage (away from humidity, heat, direct sunlight, etc.) temperatures. We do recommend to replace the seed every three years for best results. Can I use the Bios urn with existing ashes? Yes. The ashes that you preserved in another urn for years can now be transformed in a beautiful pine tree.